148Apps gave it 4 stars. 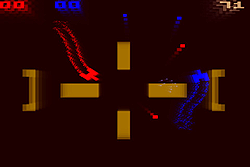 Minotaur Rescue is an oldschool arcade-style game for up to 4 players at once on iPad (2 players on iPhone). Battle gravity, space rocks and marauding saucers as you fight to rescue endangered minotaurs and survive to gain the highest score. 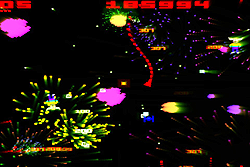 Classic 8-bit graphics combine with modern effects, intense gameplay and finely tuned touch controls to provide a satisfying and exhilarating arcade gaming experience. 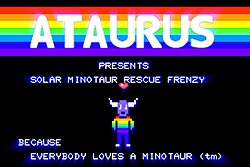 Created by Jeff Minter, one of the most experienced designers in this genre (creator of "Tempest 2000" and "Llamatron), Minotaur Rescue is the first in a planned series of games called the Minotaur Project. Imagine going into a 1980s arcade, seeing some wild game for the first time, and spending a couple of dollars playing it. That's Minotaur Rescue in a nutshell. And for roughly the price of four quarters, who could complain? It's a dynamic, beautifully designed game. This is one of the best iOS games out there. The controls are second to none, so there's no finicky joystick to get in the way of your high score! 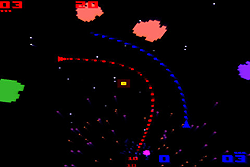 You know what you're getting yourself into with Llamasoft: always addicting games with personality! Support the little guys that care enough to get it right! This game controls better than I ever thought would be possible on an iPhone. From the pitch-perfect aesthetic to the insane gameplay at higher levels I have yet to see an iOS shooter even half as good!